If you're one of those people who simply can't see what the big deal is about virtual reality (VR), then listen up. House of Cards star and practically-every-award-winning actor Kevin Spacey is here to tell you why you should care. And, frankly, if you still don't care about it – or at the very least see the potential in it – after hearing him out, then you probably never will. 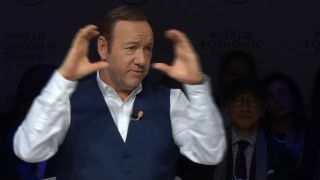 When asked by the BBC's Director of News and Current Affairs James Harding at the World Economic Forum 2016 in Davos, Switzerland, "How do you foresee it … are you a believer," Spacey waxed philosophic on VR for some of the most captivating minutes I've spent on YouTube in years. "I am a believer," Spacey sternly responds. "I've been very fortunate to be able to go and see, right up until very recently, where it all is. And, I think it's gonna' be revolutionary." Spacey then goes on to describe what he seems to think are the incredible implications of VR on sports, education and other entertainment, but focused on one piece of VR that we all haven't lent enough attention to. "I think it will end up being the home for capturing the living theatre," Spacey says, "because finally, we can take a three dimensional image and retain it as a three-dimensional experience." The actor goes on to gush about VR's implications for film, but comes back to elaborate on this point, recalling one of the trailblazers in virtual reality storytelling, Vrse.works founder Chris Milk. "I'm forced by the very nature of my job to step into someone else's shoes, to wander around in someone else's ideas, to think differently," Spacey says. "And, it's that much harder not to have empathy for other people and their circumstances that are very different from your own." "I think Chris Milk, one of the great VR pioneers said that he believes that VR is going to be an extraordinary empathy machine," Spacey recalls. Everything that is cool about VR – from the incredible gaming experiences we've already seen to how it will irrevocably transform the classroom and how it will redefine the term "front-row seat" – boils down to that very concept: the empathy machine. Now, watch Spacey elaborate above and tell me you don't see the immeasurable potential in virtual reality.